The Orlando Solar Bears debuted their new team jerseys along with the winner of the “Face of the Solar Bears” contest at The Abby in Downtown Orlando. Supporting this announcement was local government officials, team management, former players and fans alike, all hoping for the success of this future team. “It's very exciting to have the Solar Bears introduce their jerseys tonight, we have a great ownership team and high expectations,” said Orlando Mayor Buddy Dyer. The new team jersey is molded from the old design, but with a much cleaner presentation. Home jerseys are white with teal and purple accent stripes, and away jerseys are purple with teal and white stripes. The new Solar Bear team logo is featured on the front, and the bear paw shoulder pads are also back and redesigned. “It's unbelievable, I wake up every morning and ask why didn’t someone do this sooner. 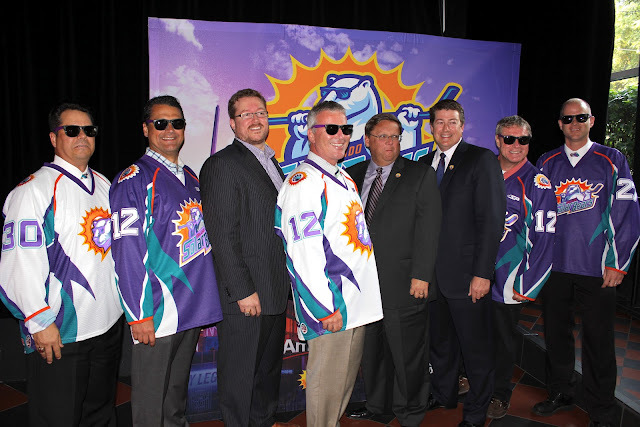 The Solar Bears belong here in Orlando,” said Bob Ohrablo, team co-owner. This new marketing campaign is to support ticket sales leading up to an open house event on April 21. The public is invited into the Amway Center on that day to personally pick out the seats they want to purchase for season tickets. 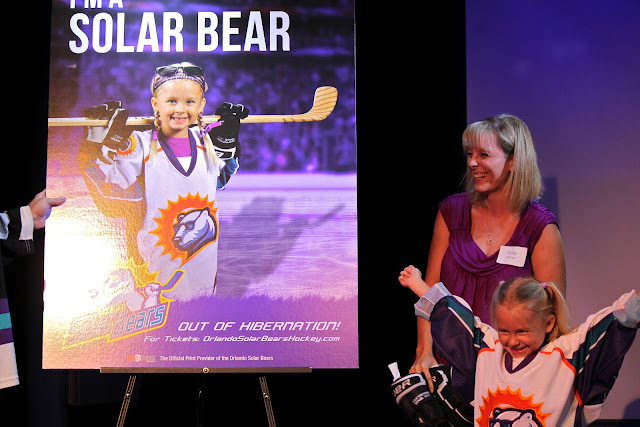 Team officials also announced that the winner of the Face of the Solar Bears contest is five-year-old Jayden Belinger. She and 14 other contest finalist will be featured on advertisements around the city. Another big step for the Solar Bears will be to announce their affiliation with an NHL partner. From there they will work with their NHL partner to search for a coach until late June or early July, and then start looking for players to prepare for a season which is set to begin in October. The team’s return is highly anticipated by local business and government officials looking to get more use of the new Amway Center, and is seen as an investment in the future success of the city. 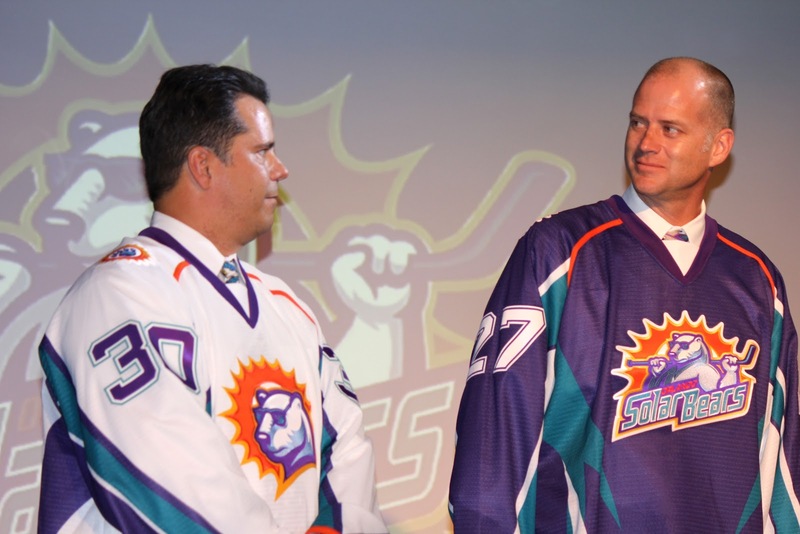 “The Solar Bears are here and we need to be proud of that. By having diversity, we help to make the city more vibrant,” said recently re-elected City Commissioner, Tony Ortiz. High expectations are growing for the Solar Bear’s emergence from their extended hibernation. Fans hope they are hungry for success and ready to show the city what they can do in the East Coast Hockey League. Solar Bears alumni goalie Allan Bester (Left) and left wing Bob Joyce (Right) present new home and away jerseys.